Recently I have been introduced to the history of the transcontinental railroad through reading Ambrose's book Nothing Like it in the World. So I searched the internet high and low for a Google Earth file that would show the original railroad with all its stops, cuts, tunnels, etc. and found nothing. Useful site to make map links. Thanks for making this... very useful. I read the book "Nothing Like it In the World" as well, and this is a very useful guide. 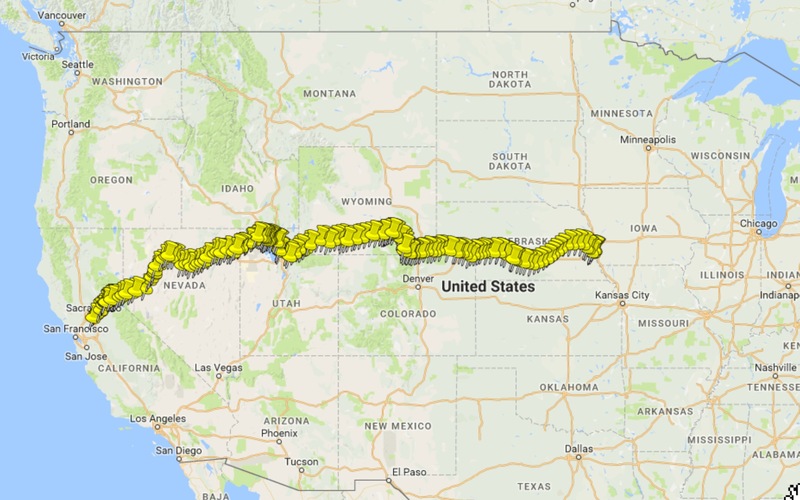 Thanks for the effort compiling the sites along the transcontinental railroad into one file. I've been rereading Ambrose's book Nothing Like it in the World and have been studying maps and satellite photos of the terrain west of Cheyenne, WY. The Dale Creek bridge, "a big bridge for a small creek that one could easily step over" (coordinates N41.1039, W105.455) located aprpoximately 4 miles west of the Sherman Summit. One can still see in the satellite photos the foundation piers and the road cuts east and west of the bridge location. Thanks for the info on the Dale Creek bridge. I've added a placemark for it and updated the .kmz file. Just wanted to add my thanks for making this file. I'm currently reading "nothing like it in the world" and this makes the book much more enjoyable. I'm following along as it gets built. I was excited to find your kmz file of "Transcontinental Railroad Google Earth Map." You put a lot of work into map file. Thanks. I think tunnels 1 - 4 are miss marked though. For this correction I am using the link http://discussion.cprr.net/2005/12/list-of-cprr-tunnels.html and the picture links at the bottom of http://cprr.org/Museum/Tunnels.html. If you look at the links on the bottom of the second page above I believe that the tunnels just east of Cisco which you have labeled as Tunnel #4 are actually Tunnels #s 3 & 38. Just east of there you have tunnel? which actually appear to be Tunnels #s 4 & 39. Tunnels 38 and 39 are 1925 era tunnels for the second track over mountains. The Tunnels you have labeled as #1, #2, & #3 west of Cisco appear to be (newer) 1925 era tunnels when the second track was laid. These tunnels are possibly Tunnels #35 and #36 which are listed near Yuba Pass (and #37 not listed). According to the first link posted above Tunnel #2 was just east of Emigrant gap and was daylighted when the 1925 second track was placed. Tunnel #1 is actually located where you have tunnel? west of your Blue Canyon pin. Tunnel #1 was widened when the second track was placed circa 1914. I also found this web site of the Cisco tunnels. Again, thanks for compiling the .kmz file. For the last three years I've been involved with a a power plant project north of Evanston. I spent weekends in September and October exploring the transcontinental route in the Evanston area. Found the town of Piedmont to be south of where you have it. Coordinates of N41°12'59.80" W110°37'32.79". A charcoal making company owned by a Moses Byrne was located in Piedmont in 1869. According to the local historical society the town was abandoned after the railroad was rerouted to the west. The remnants of one kiln still remain with three kilns reconstructed. Just NE of the site next to the road one can see the railroad grade. Interesting file. I think some of the track east of Evanston WY are at the current location not the original route. The route was relocated north when the aspen tunnels were built. I am wondering if you have the location of Tunnel 2 correct. According to other CPRR posts it was located 1 mile east of the town of Emigrant Gap. Your post shows it closer to Lake Valley Reservoir which is up toward Highway 20 exit. The west portal of CPRR tunnel no. 2 was 3,675' east of Emigrant Gap station (as of 1876). The track through the Emigrant Gap area was realigned somewhat – I believe this was a consequence of construction of I-80, but there may have been more to it than that. This is simply amazing. I am doing a digital history project on the TC railroad and this is the perfect thing to highlight on my blog. This is just for a college project, I will properly cite it and link it to your blog.